For detailed information about the conference, please visit the 2019 schedule page. The pages under the Program tab will be updated regularly as more information becomes available. The registration fee does not include accommodations. All conference sessions will be held at the Gaylord Rockies Resort and Convention Center in Denver, Colorado. Rooms can be reserved from the Innovate Travel page. Rooms will be available at the Gaylord Opryland Resort for a special OLC conference rate. Attendees of the conference must book their hotel room through the conference website no later than Monday, March 11, 2019 in order to receive discounted rates starting at $229.00 per night plus taxes and fees. The special conference rate also applies for three days prior to and three days after the conclusion of the conference. OLC will provide a printed Schedule-at-a-Glance with basic program information upon check-in at the registration desk on-site. Full program information will be available on the website (see the Program pages) beginning late November, so you can start to plan which sessions you’d like to attend beginning in December. Do you have tips for first time attendees? Please review the First Time Attendee FAQ document for additional details that may be helpful to first time conference attendees. The Effective Practice Awards webpage will be updated to reflect the current selection round. EP recipients will be asked to present their award-winning session during OLC Innovate. Follow the above link or Submit Here. Access live stream sessions starting Wednesday, April 3, beginning with the Community College Summit (beginning at 8:00am MT) and HBCU Summit (beginning at 8:30am MT). Regular live-streamed programming begins with Concurrent Session 1 at 1:00pm MT. All recordings may be accessed for 1 year post-conference. Session Access will be available to you at the start of OLC Innovate 2019 on April 3, 2019 Denver local time (MOUNTAIN TIME ZONE) and may be accessed for 1 year post-conference. Day of the conference – live streaming sessions begin with the Community College Summit (beginning at 8:00am MT) and HBCU Summit (beginning at 8:30am MT). Regular live-streamed programming begins with Concurrent Session 1 at 1:00pm MT. Session Players will not be visible until the start of the session. 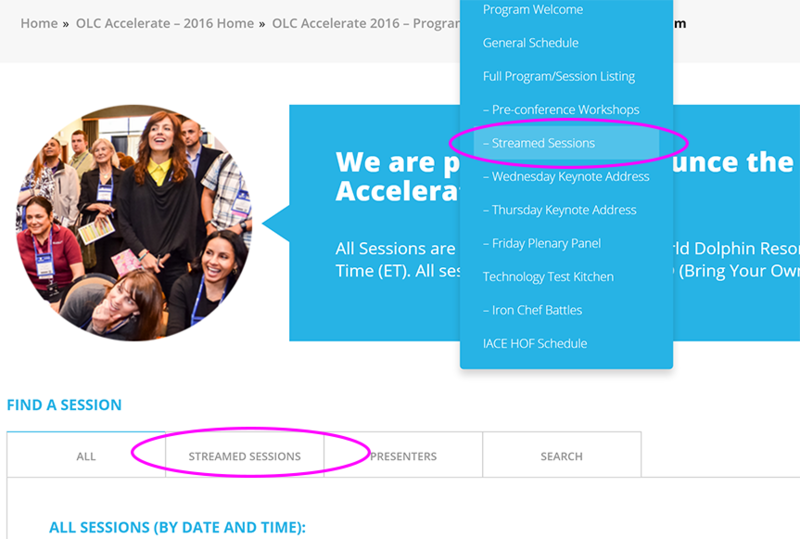 Please note: Only those sessions that are indicated in the Streamed Sessions listing will be available as part of the OLC Innovate virtual conference program. All sessions that are part of the streaming program will be listed under “Streamed Sessions” and will be represented by the icon. The “My Schedule” feature of the website and mobile app does not distinguish between streamed and non-streamed sessions. If you are using “My Schedule” be sure you only add sessions that are part of the streamed program. Streamed sessions don’t begin streaming until the time the session begins – not before the start time. Stay logged in; it will begin streaming on schedule. Remember – the Sessions are listed in the conference time zone – MOUNTAIN TIME ZONE. 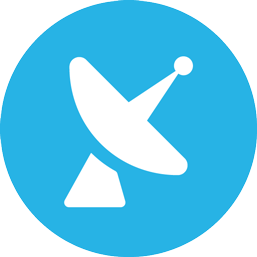 Test MediaSite Now. Test this before the event. Don’t wait until the last minute! We recommend you use Chrome as your browser to optimize your virtual conference experience. 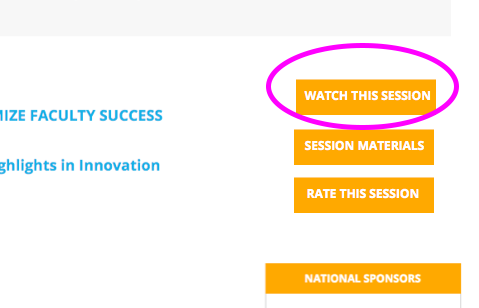 From the conference website, select the tab “PROGRAM”, then select “Streamed Sessions”. Plan ahead – know which sessions you want to attend and when they are happening. Enter the session room early so that you don’t miss anything. OLC Innovate 2019 is in the Mountain time zone – all times listed in the program are Mountain – adjust your calendar/schedule accordingly. OLC Innovate 2019 is in Denver – the sessions streamed live will follow the Mountain Time Zone. 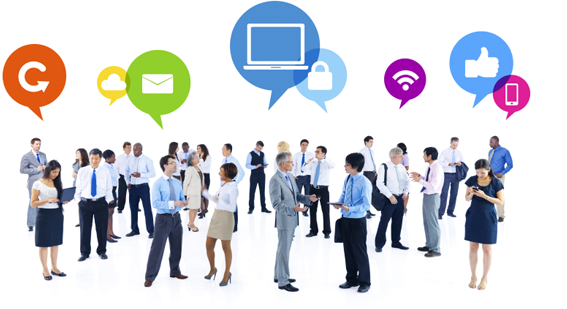 With a Virtual Group Package you may choose the package that best suits your group’s needs. There are options for 3 individuals (buy 2 get 1 free); 6 individuals (buy 4 get 2 free); 8 individuals (buy 6 get 3 free); or an Unlimited Group Package.